Societies the world over are placing greater demands on the supply of gasoline. In the U.S. alone, over half of American families have two or more cars. As developing economies flourish and become increasingly reliant on personal transportation, access to affordable automotive fuel will become a critical issue. Reducing dependence on scarce fossil-fuel resources is important to our environment, to economic health and to political stability. Virent’s patented technology enables the production of gasoline from bio-based feedstocks. Our BioForming® process produces the key aromatic molecules and paraffins that are the building blocks of gasoline. Our technology uses a wide variety of both cellulosic and conventional plant sugars, providing an economical route to sustainable biogasoline that is identical to its existing petroleum-derived counterpart. Virent’s fuels can be “dropped-in” to existing petroleum refining infrastructure such as pipelines, tanks, pumps and engines of all kinds, offering sustainable fuels without additional manufacturing investment and uncertainty. Virent’s fuel features significantly higher energy content than ethanol, with an octane rating and energy content above premium petroleum-derived gasoline. Our fuel contains identical molecules to those found in petroleum-derived gasoline allowing very high blend levels compared to ethanol and other renewable fuels that introduce new and different molecules into the gasoline pool. The utilization of renewable feedstocks in conjunction with efficient processing allows for Virent’s gasoline to reduce greenhouse gases versus petroleum-based fuels. Read about how Virent’s high octane gasoline performed in European road trials. 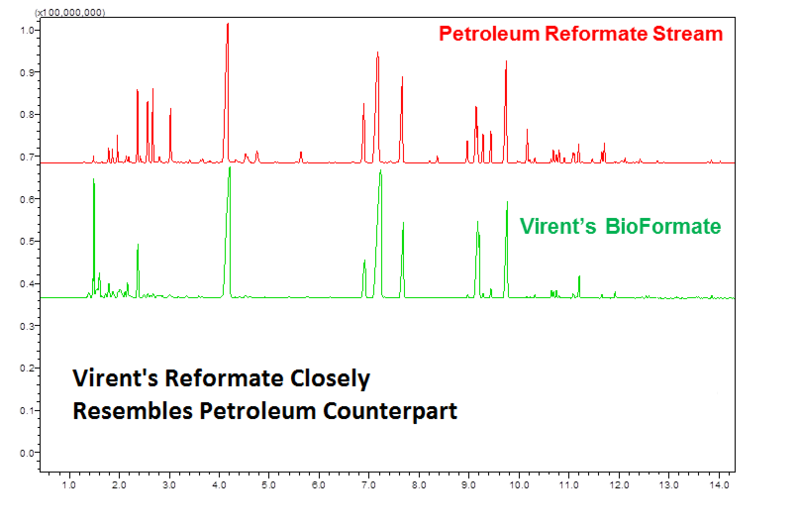 Read about how Virent made gasoline from corn stover and pine harvest residuals. Read about Virent’s fuel in the blend used by the Scuderia Ferrari Formula 1 team. Read about our full-scale gasoline demonstration facility in Madison, Wisconsin. Virent can produce a sustainable version of your gasoline.